When a resolution to the conflict is found the body goes into the healing phase. Conflict active cancers begin to breakdown, microbes may participate causing infections. Healing phase diseases really do not begin with the resolution. They go unnoticed in the conflict active phase. Necrosis or tissue break down occurs and this is painless. (This is why an acupuncturist can tell that you will be getting sick, your acupoints will be tender even though you feel fine). ♦ Fever, swelling, pain, infections, lack of appetite,and nausea. ♦ Exudation such as pus, blood, phlegm, etc. ♦ Cold hands and feet. ♦ Exhaustion, your body is telling you to rest. The healing phase is often called a healing crisis by holistic and alternative medicine practitioners and occasionally it can be most unpleasant. Resolution phase cancers are not really cancers, they are in a sense like workmen building scaffolding to repair a building. Once the repairs are complete the scaffolding can come down. Rarely the scaffolding could cut off the electricity or water. In other words, your physician should carefully follow the healing phase as surgery may be required if anything vital is blocked. In the middle of the healing crisis the brain edema or swelling reaches it's peak. Most of the time it is harmless, but occasionally the swelling can be large and very dangerous. This phase usually lasts at most a few hours. Most of the time it take just a few moments or seconds. 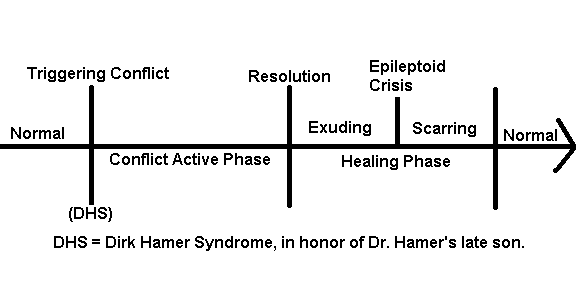 This is called the epileptoid crisis, the moment of truth as Dr. Hamer calls it. ♦ Muscle spasms, goosebumps, chills and/or shaking. ♦ Warm or burning sensations coursing in your body. ♦ Anaphylactic shock, dizziness, skin turning red, or nausea. ♦ Disorientation or memory loss that can last up to several days. ♦ Heart attack , stroke, or aneurysms. After the crisis the body goes into the scaring phase. You feel more energetic. Your hands and feet feel warm. You are well on your way back to feeling normal again. But the good news is that these serious healing phases are no longer necessary. In the past when the disease causing conflict has been resolved the subconscious would tell the body to heal and it does so with a vengeance often with unpleasant side effects. This can now be controlled with subconscious suggestion and the healing crisis is avoided and the body gently heals. Chronic illness often are based upon conflicts that are not completely resolved or they waver back and forth between the conflict active and healing phases. These are the syndromes such as fibromyalgia, chronic fatigue syndrome, arthritis, etc.